The Calendar Setup Window is divided into two parts – the left shows your settings, and the right shows you your calendar as your build it. Pick a calendar to work with from the upper left. When you first install soSIMPLE, the three included calendars are locked. We recommend choosing one that you like, duplicating it, and making changes from there. Your entire calendar is defined from these settings. This is how your calendar appears in the list of calendars above, and the title of the calendar when you’re viewing it using a web browser. This is only for your own notes. It doesn’t show up anywhere else. Provides a summary of how your calendar will function, whether it’s a “standalone” calendar or a “server-powered” calendar. 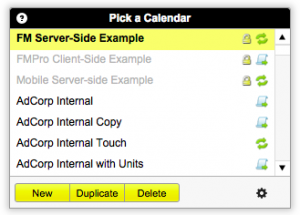 Update Method (for server-powered) – What will happen when you drag anything on the calendar? Are any critical components missing? 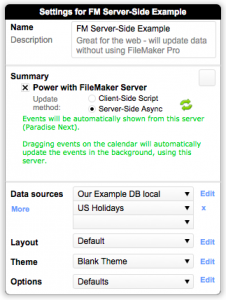 soSIMPLE calendar allows you to get your calendar information from a FileMaker database on your server, or from an iCal data source, such as the weather examples we provide. Determine which tabs and navigation tools should show up on your calendar. You can also choose what type of presentation you’d like and what language. CSS-based options to change fonts and colors for various parts of your calendar. Misc options for your calendar and labels. These three script buttons are included as scripts when you copy or import scripts from our example database, or the deployment window. Creates a printable PDF of your current calendar view using your web browser. For Standalone calendars, re-exports data and refreshes the calendar. 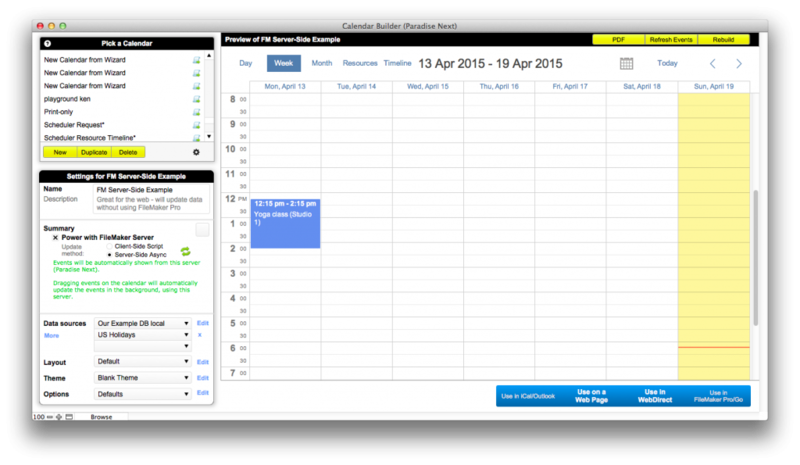 For Server-powered calendars, refresh the entire calendar – layout, data and all. Clicking each option shows the steps to use your calendar, depending how you want to use it. See Deployment Options for more details.